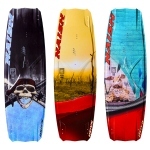 Progressive Boards best selling freeride board for the past 3 years. This kite board has a slightly wider body that help it plane up early and glide through the light sections. With a medium aggressive rocker line and 8mm concave bottom this board runs smooth through any waters. Made from paulownia wood core, ABS rails, stainless inserts, fin blocks, molded construction this boards is durable and affordable. Comes with footstraps.